The non-selective nicotinic acetylcholine receptor (nAChR) agonist nicotine has been argued to improve attention via enhanced filtering of irrelevant stimuli. Here, we tested this hypothesis in the context of smooth pursuit eye movements (SPEMs), an oculomotor function previously shown to improve with nicotine in some but not all studies. In order to test whether nicotine improves performance particularly when the inhibition of distracting stimuli is required, SPEM was elicited in conditions with or without peripheral distractors. Additionally, different target frequencies were employed in order to parametrically vary general processing demands on the SPEM system. Healthy adult non-smokers (N = 18 females, N = 13 males) completed a horizontal sinusoidal SPEM task at different target frequencies (0.2 Hz, 0.4 Hz, 0.6 Hz) in the presence or absence of peripheral distractors in a double-blind, placebo-controlled, cross-over design using a 2 mg nicotine gum. 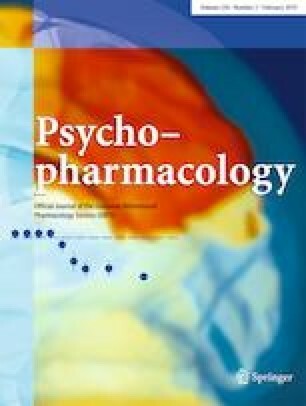 Nicotine increased peak pursuit gain relative to placebo (p < .001), but an interaction with distractor condition (p = .001) indicated that this effect was most pronounced in the presence of distractors. Catch-up saccade frequency was reduced by nicotine (p = .01), particularly at higher target frequencies (two-way interaction, p = .04). However, a three-way interaction (p = .006) indicated that the reduction with nicotine was strongest at the highest target frequency (0.6 Hz) only without distractors, whereas in the presence of distractors, it was strongest at 0.4-Hz target frequency. There were no effects of nicotine on subjective state measures. Together, these findings support a role of both distractor inhibition and general processing load in the effects of nicotine on smooth pursuit. The online version of this article ( https://doi.org/10.1007/s00213-019-05223-1) contains supplementary material, which is available to authorized users. We are grateful to the Nicotine Science Center at Fertin Pharma A/S for providing the nicotine and placebo gums. We would like to thank Felix Benninghoff-Lühl, Christina Esser, Adrian Pick and Carina Steinberg for their excellent support in data collection. Approval of the local ethics committee was obtained and the study was conducted in agreement with the latest version of the Code of Ethics of the World Medical Association (Declaration of Helsinki).